For some time now, I have been calculating things on the basis of ROI (Return on Investment). And believe me, it is a difficult proposition. Because, it is difficult to force oneself do things that have little of no ROI, or so it seems in the short term. Having said that, till about a month back, I was supremely confident in my ability to crack the CAT. 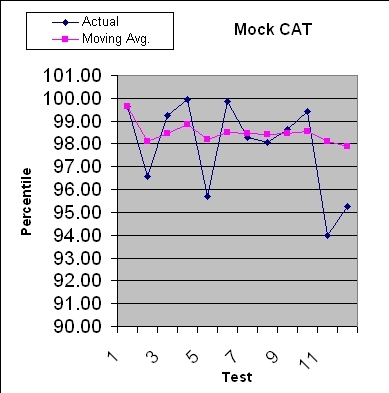 This came from the fact that the 12 odd Mock CATs I wrote, I got an average percentile of 97.88%. Discarding 3 worst and 3 best, I get - 98.37%. Roughly 98% I would say. I got >99.5 on 5/12 occasions and >98.0 on 7/12. 60% chance of qualifying 1-2 calls, and 40% chance of 4-5 calls. There is a visible dip in overall average. (Remember, these still were Ranks of 2-300 out of 15-18,000 people) In early assessment, I have rank 1,800/11,000 by one of the institutes. This was not so till about two months back, when I had 5/8 scores above 99.5 - 62% chance of 4-6 calls and 6/8 chance of qualification overall. Where did it all go wrong? I miscalculated the amount of preparation being put in by peers, assuming I will be able to easily retain this lead *effortlessly*. As it turns out, the efforts put in by peers/competitors in the last month, didn't just put me out of contention, at the same time I had put down my armor and was taking a break at my annual vacation. All this while my competition was taking 1-2 months off from work, simply to turn their 80 odd percentile to 90-95 odd, I was busy making stable releases on my workbench, taking that annual break, which ultimately blunted my overall edge. Key words - optimal, efficient, bigger capacity, accuracy and consistency. All this will come from a 3 pound brain, which is being trained and practiced throughly to take up this task. The question: Why to rev up our brains unnecessarily for such a test? This is like over-clocking our machines just to have 100fps instead of 70 which is also acceptable. The answer is, its a race, there's no prize for coming second and you get only one chance in a year. If I plot my preparedness for CAT 2006, it will be a plateau which falls significantly towards an approaching CAT. While, at the same time, my competition rose slowly and linearly to be able to peak at the D'day. The tactics involved to peak were 1-2 months of leave, 7-8 months of sub-standard work at work-place/college. The final question: Was it worth it? Yes it was. Every bit of it. But I'd say the trickery employed by the competition was not worth it. Some of them may have gone through using it, but it only goes on to demonstrate the state of India's competitiveness and means employed to get there. One request: (if someone is listening): Can't our competitions be smarter? In simpler words, can't they be smart enough to devise a test where I would qualify, without resorting to the above mentioned schema's? High hopes huh. The only gratification lies in the fact that, somewhere, it will all add up. Somewhere it all counts, and I just have to continue what I feel is the best thing to do. Rest will fall in place somewhere, sometime down the line. And then, we'll see who has the last laugh (too lofty,boastful ...?). Until then, just keeping the engine running, to avoid the rust and rot.